Florida has long been known as magnet for attracting retirees from the north. Today's lifestyle is not your parent's retirement home. Many of the retirement communities place emphasis on community for those of a similar era. There are activities, events, and friendships that endure for years. Of course, some communities do offer graduated levels of assistance for those wh o require a little more help. Below are the listings newest to the market from Sarasota, Osprey, and Venice. The list is updated daily with new listings or price changes. Bookmark this link and check back often for the newest listings. The complete list is available and can be customized to meet your homebuying needs. We'll email updates to you daily of only the homes you want to see. It costs you nothing, and you are never under any obligation to buy! 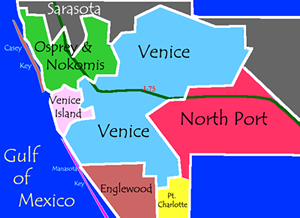 Here are some other southwest communities that may be of interest including Venice, North Port, Englewood and the surrounding area. Jacaranda C C Villas SubDv.